Loved this hostel! All the staff were amazing, great facilities, super central location and always very clean. Rate this hostel very highly! We got in late and the night manager was really nice and accommodating. Made sure we had everything we needed and offered assistance with activities. Room was really clean and nice shower and toilet. My stay was short but wonderful. 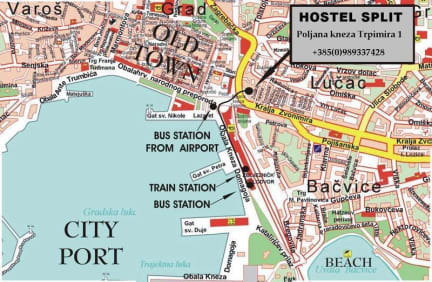 I was just passing through Split on my way to Hvar and this Hostel was the perfect location to catch the ferry in the morning. I arrived 30 min after the check in time and the guy at the front desk was so nice and accommodating and didn’t charge me the 20€ late check in fee. He also gave me all the information I could have needed and helped me with my bags to the room. Great place to stay short term. Very nice clean modern rennovated apartment interior. Staff were very friendly and helpful. Would recommend. Staff were lovely and the room was spacious and clean. The location, while close to the old town, was also located in a back alley which was very noisy early in the morning with workers throwing things in the dumpsters. I honestly haven’t been to a hostel this non-accommodating in awhile. It’s easy to tell that this hostel is only around to make money, not to help their guests have a good time in Split. Got to the hostel after a long bus ride and staff had no change so made ME go to a supermarket to get my own change to pay for my stay. Then showed us to our room which looks like it is for toddlers. The bunk beds are TINY and are packed in a tiny room with one bathroom for everyone. Pay to store luggage also.. Location was so far out couldn’t do anything. Rooms and bunks are so small. Anyone over 6ft will struggle to sleep here. Very loud at night with lots of mother bikes constantly being revved.